(0 Customer Reviews) | Write Review 6 issues per year K&B Journal is the UK’s leading kitchen, bathroom and bedroom magazine. Covering all aspects of the KBB industry, Kitchen & Bathroom Journal provides retailers, designers, installers, merchants, specifiers and buyers with a valuable source of product news and informed comment, whilst providing manufacturers with a direct route to those who make the buying decisions. Every issue contains carefully researched features on appliances, furniture, components, décors and materials, as well as product showcases, product news, company profiles and business news from the kitchen and bathroom business. Exhibitions, both in the UK and in Europe, are covered in depth by our expert team of journalists and photographers to give you the very best news and reviews to keep you in informed. K&B Journal is the UK’s leading kitchen, bathroom and bedroom magazine. 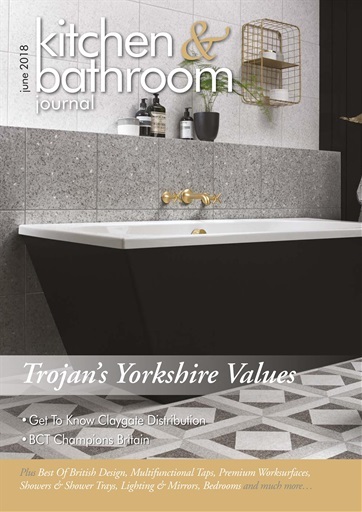 Covering all aspects of the KBB industry, Kitchen & Bathroom Journal provides retailers, designers, installers, merchants, specifiers and buyers with a valuable source of product news and informed comment, whilst providing manufacturers with a direct route to those who make the buying decisions. You'll receive 6 issues during a 1 year Kitchen & Bathroom Journal magazine subscription. You'll receive 6 issues during a 1 year Kitchen & Bathroom Journal magazine print subscription.